Clothing Consumption in America and Beyond - Planet Aid, Inc. 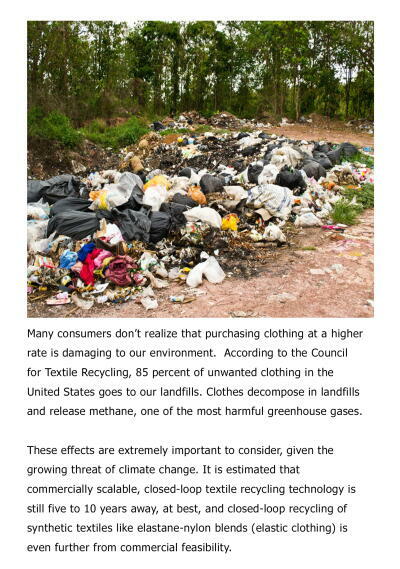 Clothing and clothing waste have been making headlines lately. Newsweek and the Kansas City Star both recently took a close look at clothing consumption in the United States and what happens to unwanted textiles. According to Newsweek, Americans are consuming clothes at a higher rate than ever. The volume of clothing that we now throw away in the United States has doubled in the last 20 years from 7 million to 14 million tons, or approximately 80 pounds per person per year. Only 15 percent of this vast quantity of clothing waste is reused or recycled, a figure that is a mere fraction of the recycling percentages of materials such as paper or aluminum. It’s great to see attention being paid by major media outlets to this increasingly serious issue. This attention will hopefully raise greater awareness and help to change consumer behaviors as well as the practices of textile manufacturers. Some clothing retailers have already begun to recognize that business as usual is no longer an option and are thus attempting to “green up.” Just last week, major fast-fashion retailer Zara announced that it is launching a sustainable clothing line and will soon begin to accept used clothing at its stores for recycling and reuse. 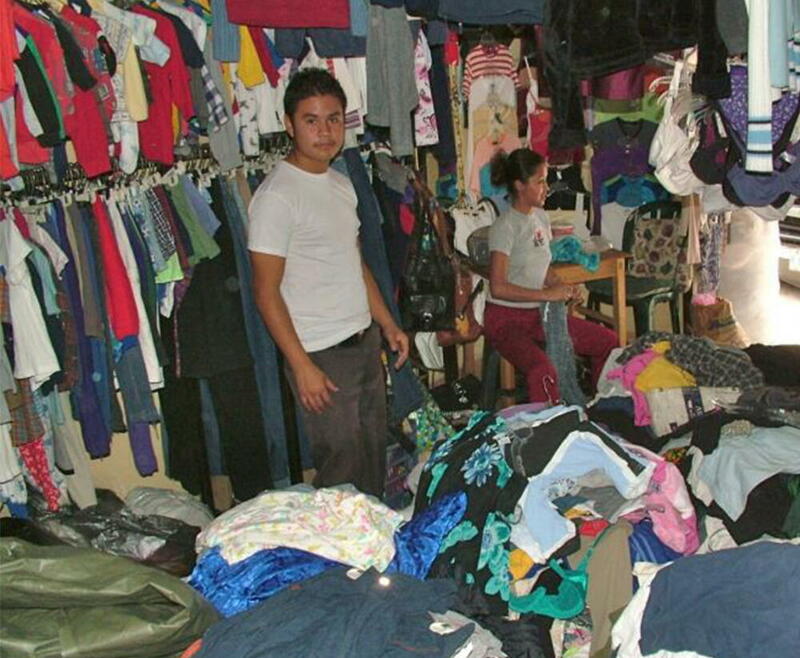 One of the little-known facts reported by recent news stories is just how much of the donated clothing collected in the United States is used domestically. Newsweek cited statistics from the Council of Textile Recycling that showed that charities overall sell only 20 percent of the clothing in the United States that is donated to them. So where does it go…. Most of the clothing donated in the United States is sold internationally and ends up in secondhand clothes markets in developing countries. These markets are where individuals in the developing world clothe themselves and their families. For example, Newsweek reported that 81 percent of the clothing purchased in Uganda was secondhand. Selling used clothing to developing countries is sometimes criticized because it is believed to undermine local production of textiles. But what the critics fail to point out is just how many people depend on secondhand clothing for their business, from tailors to traders to truck drivers and so on. Those who have seen just how deep secondhand clothing is embedded in the culture and economy of developing countries understand this. For example, Peace Corp volunteer Rachel Chaikof discusses in her blog, Rachel’s Field Notes, how her view of secondhand clothing imports changed when she began speaking to people about it in the local market in Cameroon. What she learned is that secondhand clothing allows for those in lower social economic classes to afford clothing, as new clothes can be prohibitively expensive. “Because of what I have read in the news about secondhand clothing being donated to Africa, I had originally thought that it had a negative impact. However, when I asked Ruth, my counterpart who is a businesswoman and owns a shop near where many tailors work, for her perspective, my viewpoint changed,” Chaikof says. Ruth explained that the tailoring market and the secondhand clothing market are two separate markets that co-exist. The secondhand clothing market allows people with minimal means to be able to afford clothing and provides jobs for many people locally who are involved in the trade. • Think twice: Do you really need new clothing as often as you buy it? Try not to replace designs in your closet as often as the retailers introduce new designs in the stores. • Buy clothing that is sustainable: Clothing that has been produced by recycled clothing is more sustainable for the environment. If you are into the fast-fashion retailers, try to purchase items from their sustainable clothing lines. • Quality over quantity: Find items that you will get the most use out of, even if it is at your expense. A $50 sweater may be more expensive in the moment, but if you get a year or more use out of it, you will save money in the long run, rather than having to replace a $15 sweater multiple times over the course of a few months.